There was a time when surfers, skateboarders and snowboarders were brothers, passing doobies between sesh. 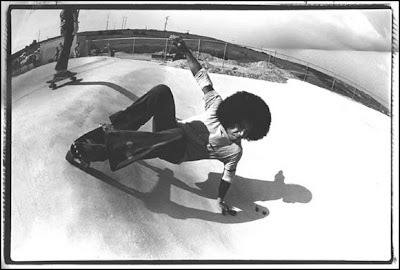 Just kidding… Back in the 70’s Larry Bertleman had a major influence over the skateboarders’ world. So big that one basic skate trick still bears his name: The Bertleman. Other surfers, like Buttons Kaluhiokalani (whose birthday is tomorrow), have left a legacy over skateboarding and practiced both. Of course, let alone the Z-Boys who had to surf before they actually skated. But it did not take long for surfers, skateboarders and snowboarders to become cousins and eventually distant parents… With each sport going its own course, try to tell a street skater from London or Mexico that his sport has evolved a long time ago from surfing and he would mumble something like in the beginning there was only chaos and that the 3 sports were essentially independently created from scratch… Hum… We actually all know who the best surfers, snowboarders and skaters worldwide are. ﻿ But who are the best in all three sports altogether? Duh? We all ended up as estranged family until Tim Hoover came up with the strange idea of the Ultimate Boarder in 2005 to proving that the skills of riding one board can translate to the surf, snow or concrete and he created a competition. The final winner of the competition was the one who had placed highest in the three events. Tim Hoover grew up surfing and skateboarding in Goleta, California. Throughout his life, these board sports provided a tremendous source of escape and a positive outlet. As the history and popularity of board sports evolved, along with the influence of friends who shared similar interest and ideas, Tim was inspired to establish an event and brand that encompassed all three disciplines. ﻿ The Ultimate Boarder is actually not a bad idea, especially since so many surfing tricks are named after skateboarders’ maneuvers: Lien, Stalefish, Mute, Slob are basically the same in Surfing and Skateboarding. The Ultimate Boarder triathlon typically does well with Southern California athletes who are born and bred into the skate/snow/surf lifestyle. Does that mean you have to be from Southern California to be an Ultimate Boarder? No, but that helps. Where in the world can one guy skate, surf and snowboard all in one single day? Again, how a skater from Liverpool, Munich, Paris or Chicago can recognize his sport through the ever tanned dudes of southern California? When it comes to board riding, the SoCal natives are blessed! So, in 2007, Tim established a company and developed, financed, branded and managed the first-ever Ultimate Boarder Championship, with a dream that riders from around the world could compete in a weeklong triathlon style event in the disciplines of surfing, skateboarding, and snowboarding. Opening the field to both amateur and professional athletes, the competition became a reality in 2008, giving riders a chance to compete for the Ultimate Boarder Champion title and a first place prize of $30,000. In the skateboarding and snowboarding portions of the event, a panel of World Cup certified judges were hired to score the competitors skills on a custom mini-ramp/vertical section for the skating and a Slopestyle course in the mountains for the snowboarding. As for the surfing portion, surfers competed in a traditional five-man heat format and were scored by ASP sanctioned judges. Being hailed, "the triathlon of a new generation", Hoover capitalized on the growing popularity of these sports. He focused the event as a way to promote healthy athletic lifestyles to young people in a positive and competitive environment. The ultimate goal remains, to find riders to become the next hero of a new generation of board sport enthusiasts. 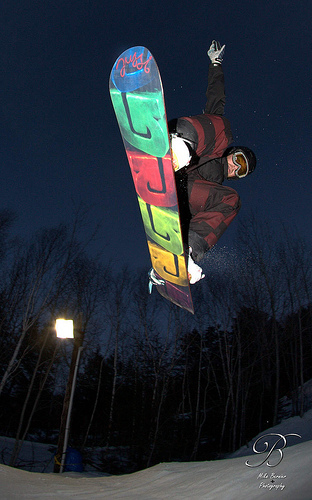 In 2008, the first-ever Ultimate Boarder Championship took place garnering over 120 million media impressions, and was awarded "Best New Sports Event of the Year" by Sports Travel Magazine. The event was won by Aaron Astorga, Followed by Todd Richards and Kristian Philipp taking third. In year two, the competition evolved as Hoover looked to get more riders involved by adding a "TEAM" division to the event which created two separate, yet complimentary events that could exist during the same week. The "SOLO" division would continue to seek the one athlete who could conquer all three disciplines while the team division would combine three different athletes who would join forces with each other and each compete only in his/her core discipline. On April 4-11 of 2009, the second annual Ultimate Boarder Championship kicked off sponsorship by Coast Body Wash featuring nearly one hundred pros and ams. A 1-hour TV show was produced with a Primetime Premiere on FUEL TV. Chad Shetler, was crowned the Champion and Team Hosoi, which included Tom Curren, Christian Hosoi and Bjorn Leines, took home the team title. In year three, 2010, the event once again brought out some of the biggest and brightest stars in the industry and a new title sponsorship, SANDISK. MTV2 covered the event producing three one hour episodes for their "Rock n' Jock Countdown" show hosted by Dirty & Todd Richards. A one hour show was then produced and again licensed in syndication in over 100 million households. With the most exciting finish in event history, Chad Shetler would once again top the podium, this time sharing the points lead with Laguna Beach's Mike Morrissey crowning them Co-Champions. Team Hosoi repeated their win as Team Champions with another impressive roster consisting of Rob Machado, Christian Hosoi and Brandon Cocard. Now, in only its fourth year, the Ultimate Boarder Championship has become one of the premiere action sports events in the world. Elite athletes from each of the surf, skate, and snow spheres enter the competition. The title of Ultimate Boarder has become highly sought after and a respected entity within the action sports world. How do you call this trick over water? In the first three years, the event has had such high profile athletes participate such as: Andy Finch, Andy Macdonald, Bjorn Leines, Christian Fletcher, Christian Hosoi, Dave Downing, John John Florence, Kurt Wastell, Lyn-Z Adams Hawkins, Nathan Fletcher, Omar Hassan, Rob Machado, Shaun Tomson, Shayne Pospisil, Steve Caballero, Todd Richards, Tom Curren, Tosh Townend, 2008 Champion Aaron Astorga, 2009 & 2010 Champion Chad Shetler and 2010 Co-Champion Mike Morrissey. “The event shows the history of boardsports and it also shows the future and ties it all together better than any other contest around,” said Nat Young, five-time World Champ Surfer and author of The History of Surfing. The Ultimate Boarder contest – which challenges athletes to see who is best in ALL THREE sports – is coming up quick, kicking off with the first leg up in Mammoth Mountain on April 2.